I’m SO thrilled to finally share the exciting project that I’ve been telling you about on my Instagram. Almost two years ago I had the incredible opportunity to start the process of designing my very own jewelry collection. It’s something that I’ve dreamed about doing since I was a little girl, so the fact that it is actually happening truly feels like an absolute dream come true!! The collection is full of feminine, yet timeless pieces that can be dressed up or down, and hopefully be something you’ll want to wear today and ten years from now. Much of the inspiration behind the collection came from my office/closet space. As I was finishing up the design process of this part of my home, I began designing Pink Peonies Collection. 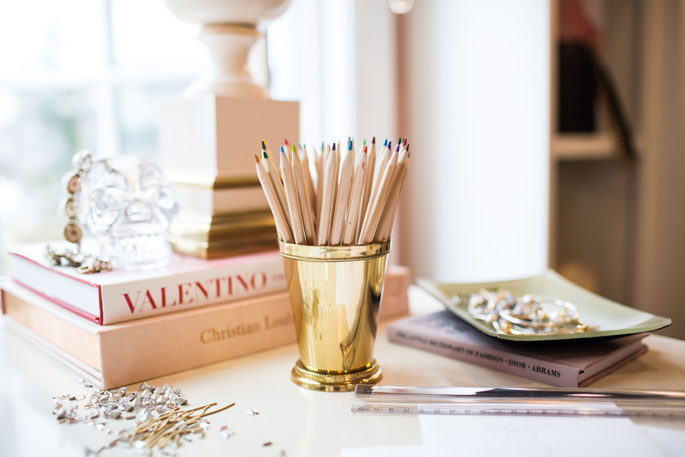 The finishes, furniture, accessories and fabrics in my office perfectly embody my personal style so it only felt fitting to draw inspiration from this space for my jewelry collection. Thank you so much for all of your support, this opportunity would have never come to fruition if it weren’t for all of my amazing readers. I can hardly wait to show you the collection (stay tuned) and hope you love it as much as I do! Oh wow!!! Congratulations! It’s so amazing and inspiring to hear that your dreams are coming true! Can’t wait to see and shop your collection! That’s such a great opportunity for you! What brand are you partnering with? Congratulations Rachel! This is SO exciting! Congrats Rach!! I’m so so pumped to see what you think up!! Congratulations! This is so exciting, can’t wait to see your line!! Congratulations!I can’t wait to see it! You look beautiful! How exciting! Such a beautiful office space and such an awesome opportunity! SO fun! Congrats!!! Can’t wait to see the collection. double take… I can’t get over that leopard print carpet! Adore beyond measure! Sounds wonderful Rachel! I am definitely in when your collection is available for sale! Yay for following your dreams! This is so exciting!!! I’m so happy for you!!! CONGRATS!!! Congratulations Rach! That sounds like every girl’s dream! So neat! I can’t wait to see the designs. Congratulation, Rach! Your closet is a DREAM closet, amazing! Congratulations Rach, such exciting news. I remember when you first unveiled your office space/dressing room, it’s the most gorgeous room! Can’t wait to see the collection. Good luck on your collection! it will be awesome! and I love your blazer. Btw Happy belated Birthday, I know it was yesterday. ps. New outfit on my blog! Congratulations! This is so exciting for you, and for us readers as well! I’m sure the collection will be amazing and I can’t wait to get my hands on it! Congrats! This is exciting! Can’t wait to see the collection! Congrats!! Such exciting news! When will you debut the collection? I would love to incorporate the pieces into my wedding! Congrats, can’t wait to see everything! Love these pictures by the way. How exciting! I can’t wait to see your designs! I am so happy for you Rachel! Cannot wait to see the pieces!! Congrats! I am so excited for your jewelry line… 1) I know it will be adorable 2) living our a dream is always such a fun thing to celebrate! I hope you have a great day! Can”t wait for it be available! I adore your office, it’s so glamorous! Congrats! What a wonderful opportunity! YAY!! That is so exciting! With your experience in styling, I’m sure you’ve got loads of wonderful ideas. Big things to look forward to! Also, I am loving that leopard print rug – I would rock that all over my apt ;) Happy Thurs! Congratulations! Can’t wait to get a peak of the collection. Congratulations!! That is SO exciting! I can’t wait to see the pieces. Absolutely stunning!!! How exciting. Can’t wait to see more! Happy birthday for yesterday! So awesome! Congratulations, Rach! Can’t wait to get my hands on some of your pieces. Amazing! Congrats Rach! Love that your work space is in your gorgeous closet. Can’t wait to see the whole line! Congrats, that’s so exciting! I can’t wait to see your collection! My style is also feminine and I’m trying to incorporate more classic/timeless pieces. 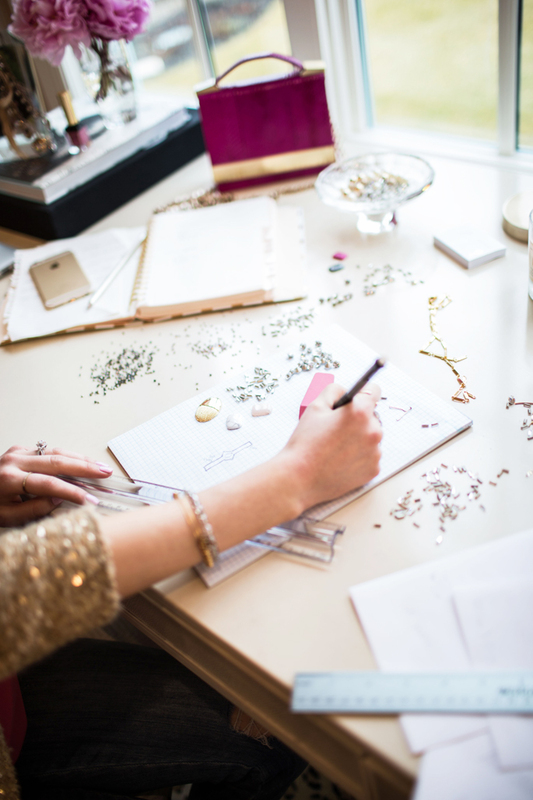 If the jewelry is anything like your office space I know it will be beautiful! congratulations! that sounds like an awesome journey and i cannot wait to see some of the pieces! How exciting! Looking forward to seeing your collection! I love your beautiful office space/closet! The perfect spot to draw inspiration! Congratulations! How exciting! I’m looking forward to seeing your collection. I know it’ll be fabulous!! WOOOW Rach! This is a piece of great news! Can’t wait to see your designs!! congratulations! such exciting news – i’m sure all the pieces will be gorgeous! Wooow I can’t wait to see all your jewellry!!! Your work space is so beautiful!! Yay!! Congratulations!!! Hopefully I can afford one piece! Hopefully I get the chance to buy something from you as well here in Germany! Congrats! Can’t wait to see more! Congratulations!!! This is big news!!! And truly perfect for you. I can’t wait to see all of your designs!! It is fun to hear about your creative process!! Great pictures. Congrats! I love your style so I’m excited to see the jewelry you designed! How exciting! That’s definitely a dream of mine too! Can’t wait to see what you come up with! Congratulations! I cannot wait to see the collection..
That’s so exciting! Congratulations! 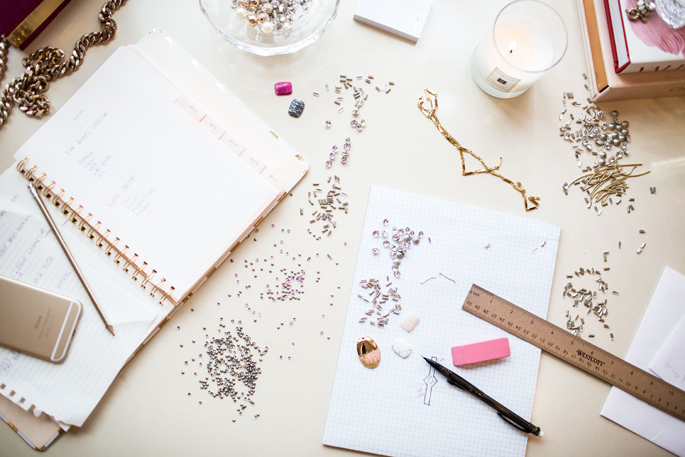 We can’t wait to see your first pieces of jewelry! CONGRATS RACH! What am amazing opportunity! I can’t wait to see everything! Congratulations! Can’t wait to see! Love the jacket! Oooo this is so fun!!! Congrats to you! You deserve it, you work so hard! That is amazing!! Congratulations! Can’t wait to see the collection- I know I will love it. What exciting news!!! This is so special and so exciting for you and your family! Best of luck and I can’t wait to see how it all turns out! Wow that’s big! Congrats on collection! And woooow what an amazing closet! Yay! That is so exciting :) I can’t wait to see the pieces that you have designed! Way to follow your dreams girl!! I’m a huge fan and I love following you and your sister!! I think the both of you deserve a reality show, I would totally watch! Your both an inspiration!! Keep up these great posts!! Congratulations Rachel, that’s so exciting! I can’t wait to see the collection, I’m sure it will be stunning! So happy for you and can’t wait to see the jewelry collection! Congratulations!!! How exciting and well deserved! Congratulations Rachel! How very exciting!!! I can’t wait to see your new collection. Congrats! That’s amazing! Can’t wait to see your designs! So awesome Rachel!! Congrats & I cant wait to see your pieces!!! Fantastic news! Congratulations – this Irish lass is very much looking forward to seeing the collection! This is so exciting! Congratulations, and I can’t wait to see what you create-I’m sure they will be fab! Congrats! It’s really great! And I love the fact that you’re office is in the closet, in the place you get your inspiration! So excited to see the pieces! So excited to see your collection! How awesome!! Congrats on designing your jewelry line! I’ve always wanted to do the same. What an amazing opportunity for you. Congratulations Rachel, what an exciting endeavor! I absolutely love your personal style and I cannot wait to see your pieces. Congrats on the amazing opportunity! I can’t wait to see the final pieces. I know they’ll look amazing because you have such a great taste in fashion and trendy pieces. Oh my gosh!! I am so happy for you! I can’t wait to see what you have designed! Congratulations. I fell in love with your closet once again. Congratulations! So many exciting things for you this year! This is amazing! Congratulations! I can’t wait to see your collection. So exciting!!!! Can’t wait to see it! Congrats on getting your own jewellery line! You have such a pretty workspace. Congratulations! I used to design, make and sell my own jewelry collection before I had children. It is a lot of hard work but fun at the same time. I look forward to seeing your designs. Best wishes for your new business and congratulations! Congratulations on this exciting adventure!! Can’t wait to see how the pieces turn out! Congratulations! Will any of the designs be hypoallergenic? Amazing news! Can’t wait to see it! These are truly exciting news! Congrats! I love your home office decor! It looks so chic! 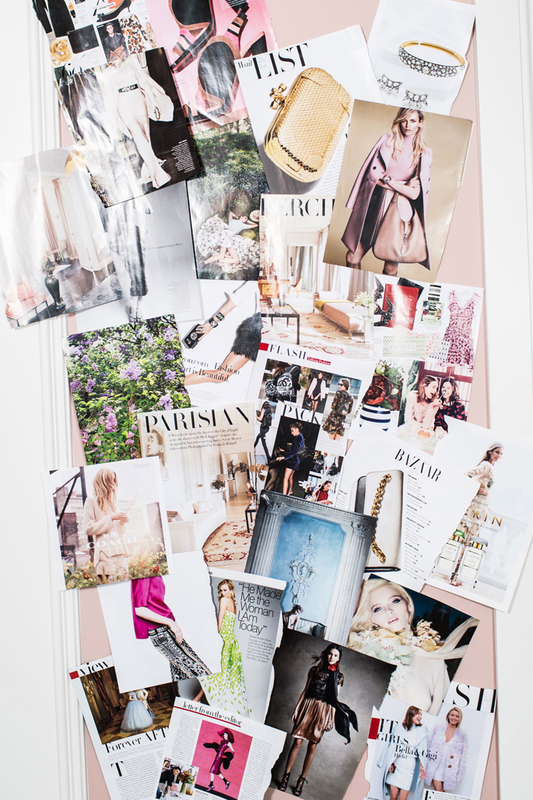 Especially the inspiration board! Congrats! That’s awesome news. You’re such an inspiration, this is the true meaning of dedication and hard work! I love your office, the leopard carpet is my fav. Congratulations on this! I’m so excited and cannot wait to see your line! Your working space looks absolutely fabulous! And it must be so exciting to design your own jewelery collection, congratulations! Huge congrats! and you have a very pretty work space, love love love! You’ve been working on this project for two years and you can’t show one piece???? Where did you get your desk? Or do you know the manufacturer. I am re doing my office. Thank you Rach! I am so excited to see the collection, I am sure it is going to be fabulous!! I already know I want every piece! Congrats!! Congrats! Can’t wait to see what fab pieces you’re going to come out with! I hope you have a little something at every price point! Wow, so exciting! Congratulations and can’t wait to see your collection when it comes out! How exciting – your home is so gorgeous and I love all the Rosé blush details and the leopard carpet is so fun. Can’t wait to see your jewelry collection. 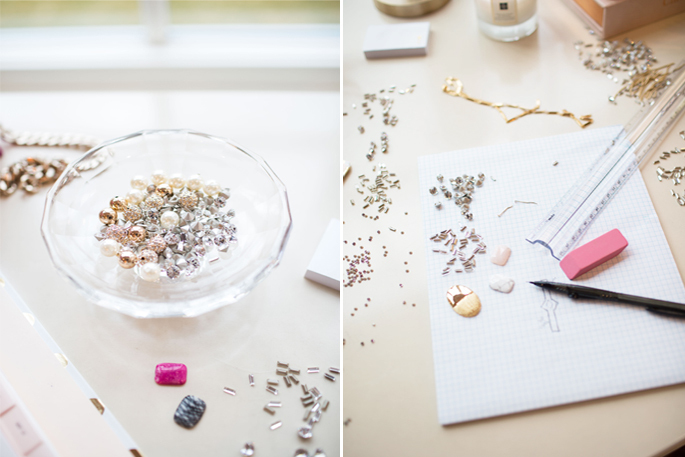 Wonderful workspace…. So Chic !!!! I am completely amazed by how much your blog and personal brand has grown. Where will the line be available? I don’t see any of the jewels or beads that made into the collection on your desk. How did you choose which to use? Where did you source the materials? I’d be interested in learning more about the process. I love your sequin robbi & Nikki jacket and found one on tradseY. IM not sure what size to get. Could you tell me what size you Are wearing? Thanks!